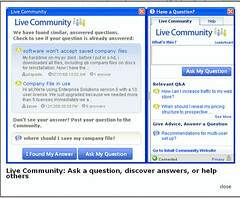 Left Image: This sample screenshot of the embedded community experience from the Quickbooks site. Over the next few years, expect your friends and network of experts to be interacting with you as you use desktop software –community will be integrated within your products. This weekend, I had a discussion with Scott Wilder at Intuit, who is one of the practice leaders when it comes to community and how it impacts business. He’s one of those leading the charge at Intuit, who has developed very large communities that thrive beyond the product itself and serve the lifestyle of the community. Scott discussed his strategy of embedding the community features right in the software products –extending the discussion, network, and peer to peer strategy past awareness, consideration, purchase all the way to support and development. Although this is mainly a supporting objective, when brands embed community this close it’s naturally going to lead to ’embracing’. Watch this video to learn about all five objectives: listening, talking, energizing, supporting and embracing. The software product embeds the community features right into the Quickbooks, not a link, not a popup, but as part of the product experience. Of course, more challenges lay in wait for Intuit: 1) They need to have a plan to ensure the community will understand and adopt these changes 2) Need to make it clear what the scope of this community is and what it’s not 3) Be internally prepared for what changes this brings to future product development and how it impacts support –undoubtly, customers will make product suggestions, and others will chime in. How can this cascade to other products? Microsoft, Dell, Oracle, SAP, IBM, HP, Symantec, Electronic Arts, Hitachi, Adobe, Autodesk (Bill Johnston leaves this comment), and Apple can start to embed community into their desktop operating system and software. TV shows can start to allow users to embed community actually on the TV set (we saw an early taste of this with Current TV during the elections), and the possibilities can continue on. Now if you have a software product and a community, forward this post on to them, and initiate an internal discussion, to find out if customers are really core to your mission, and when this would make sense to trial or even put on the roadmap. All of this points to the larger trend how people are connecting to each other, and forming their own power bases, some companies who embrace this stand to benefit –but only if they are prepared.